This honeybee has been busy. She’s already got a load of willow pollen. 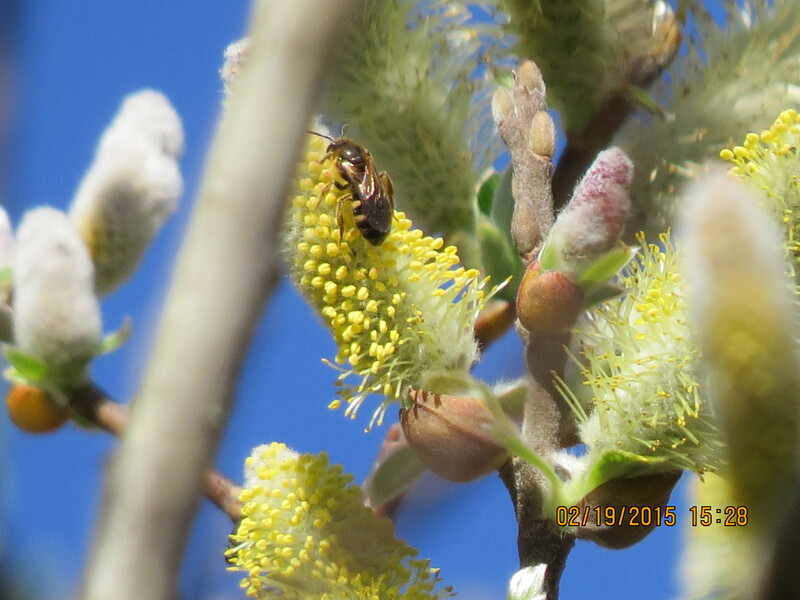 February 19…bees enjoy the willow blossoms along with robber flies and other pollinators. 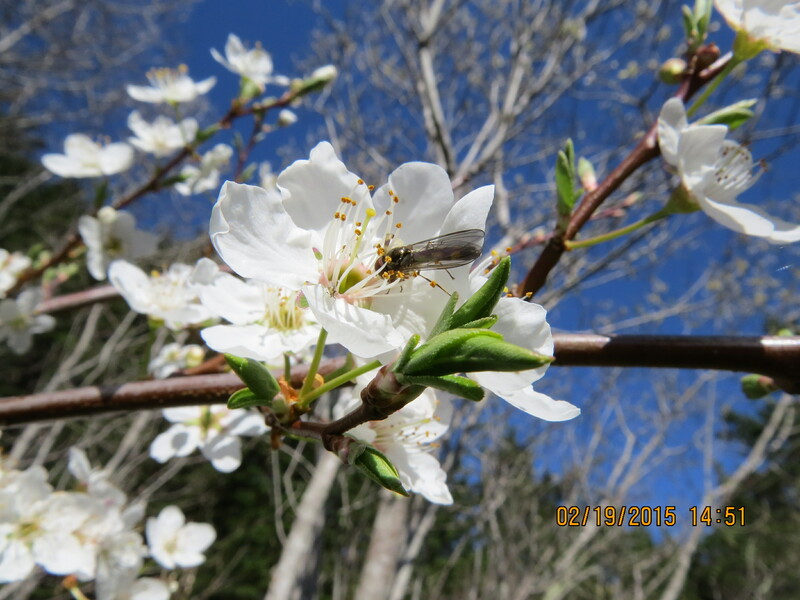 Another robber fly on a plum blossom. See Michael Marlow’s comment below. I’m not sure what kind of bee this is. A gorgeous blue sky warm day…while the East Coast is getting battered with snow storms. 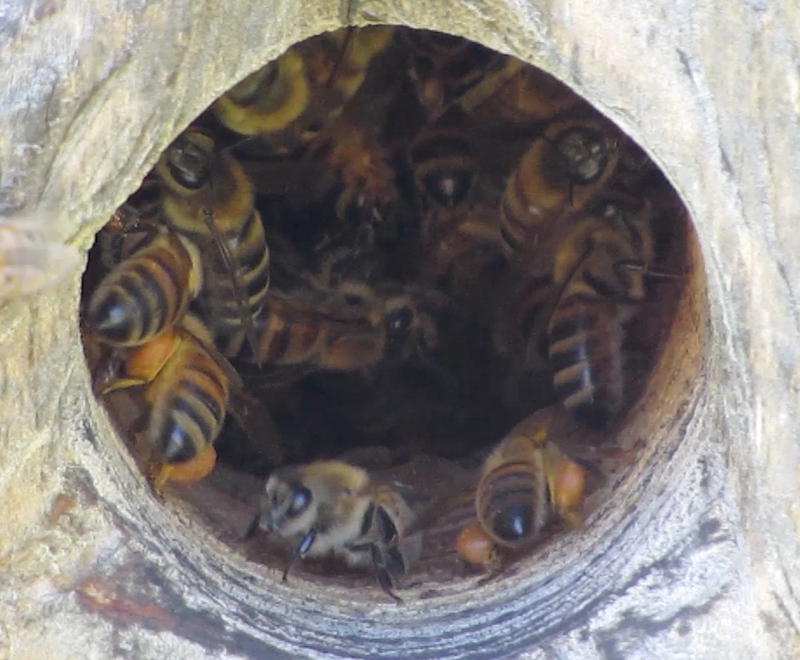 A look inside the little birdhouse bee hive with willow pollen being carried in. This little bee hive is doing well despite being in a small space in the winter shade. I’ve got to keep the swarm if I can…it’s got good genetics. 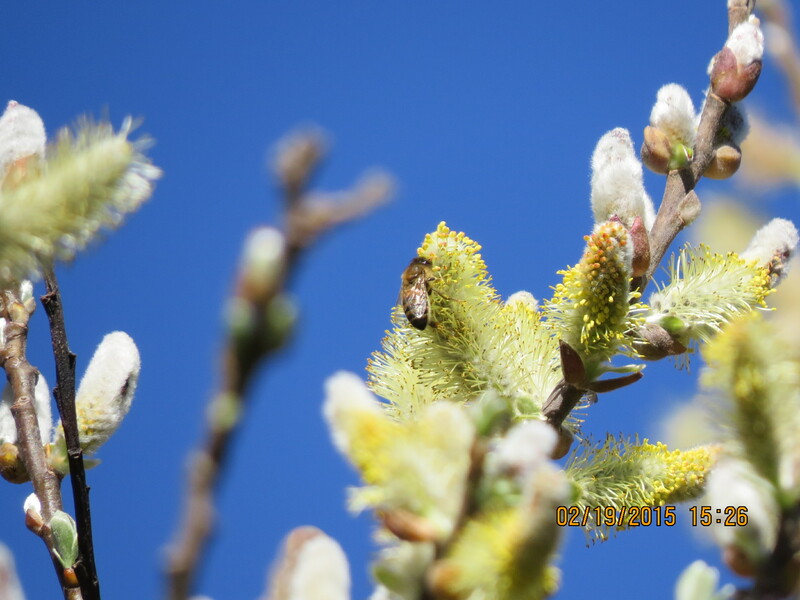 Of course, the other hives are enjoying the willows too. 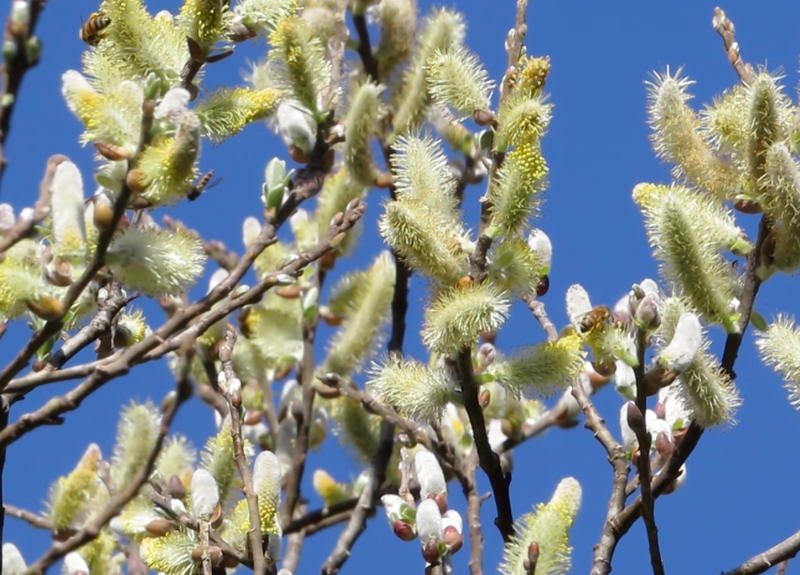 Here Bee Beard has bees swaggering in with their bags of pollen. There’s something going on in the background. 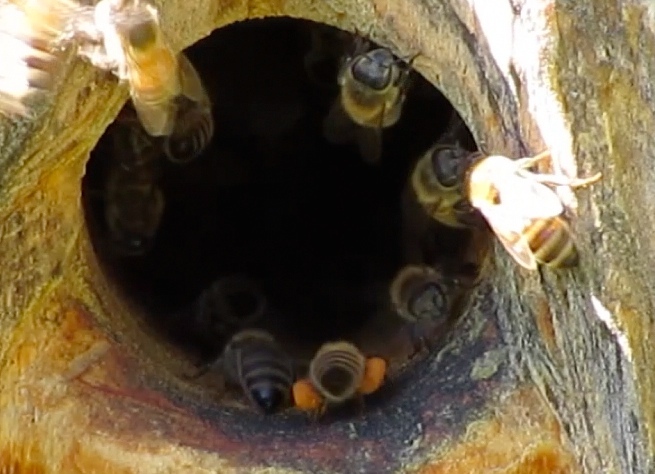 I can’t figure out what the bees are doing, but if you look at the video, see if you can tell what they’re doing. Not to be outdone, Bee-atrice’s bees have been busy too, with a bee fanning at the entrance. February 24…I visited Brian Vorwaller today. I just wanted to see the log standing upright. He thinks he can start on it next week. 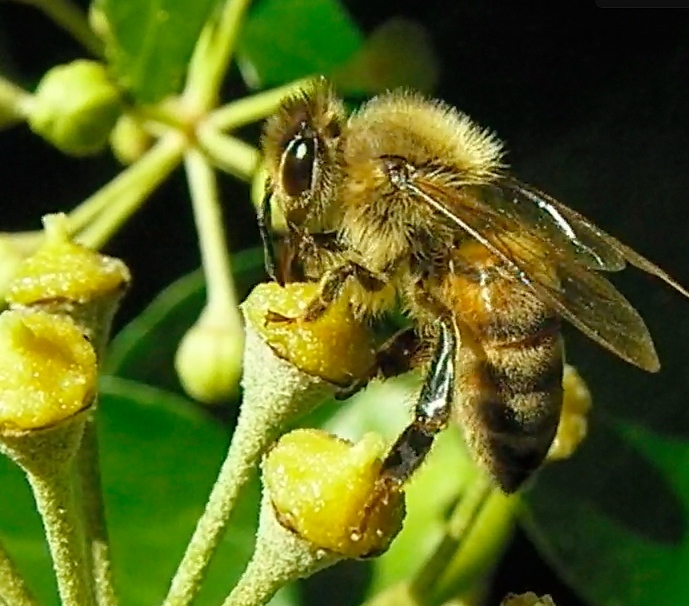 Mid October…the bees are bringing in baskets loaded with orange pollen. 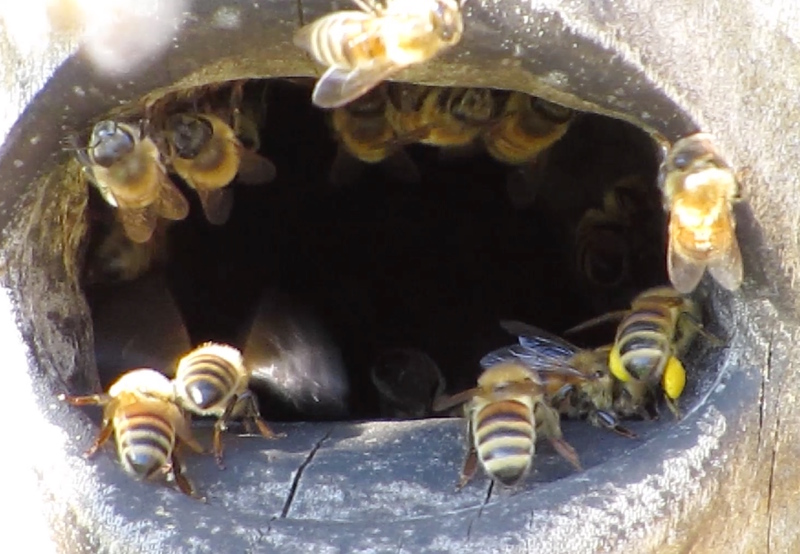 When I saw how much pollen was coming into Bee Beard log hive, I wanted to find out where it was coming from. I knew it had to be ivy because that’s the only thing in bloom this late. I set out to prove my theory. I went to my known ivy patches, which just happened to be in the sun…perfect. 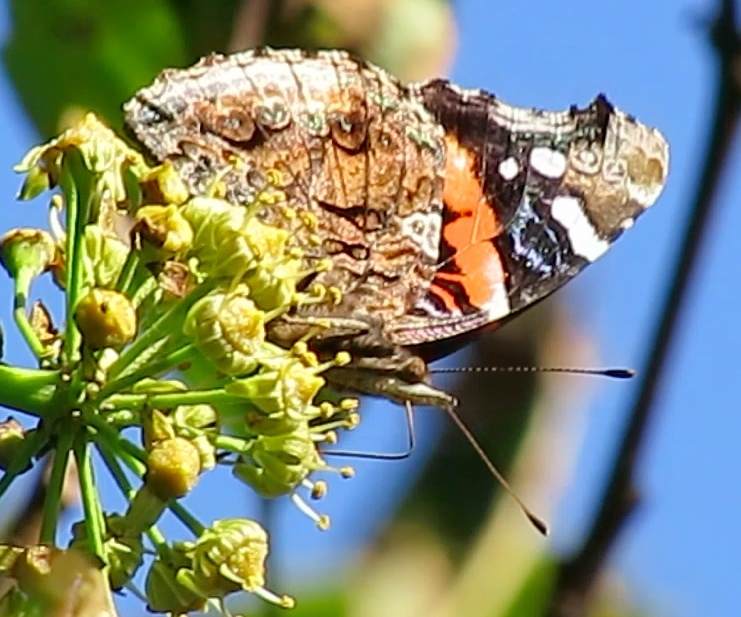 I didn’t see any bees at this first place, but this butterfly posed for me long enough to get a short video. She is sipping nectar through her long proboscis which acts like a flexible straw. 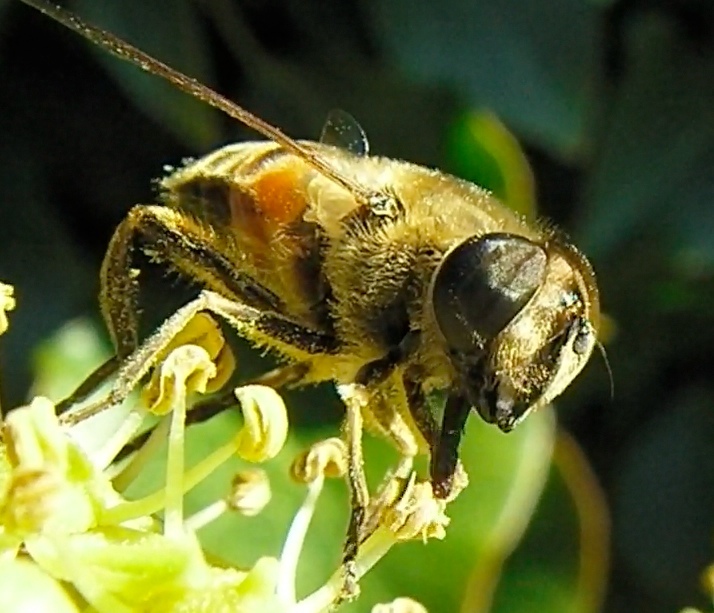 This looks like a bee, but the eyes are different. It’s a fly who is grooming herself in the sun. 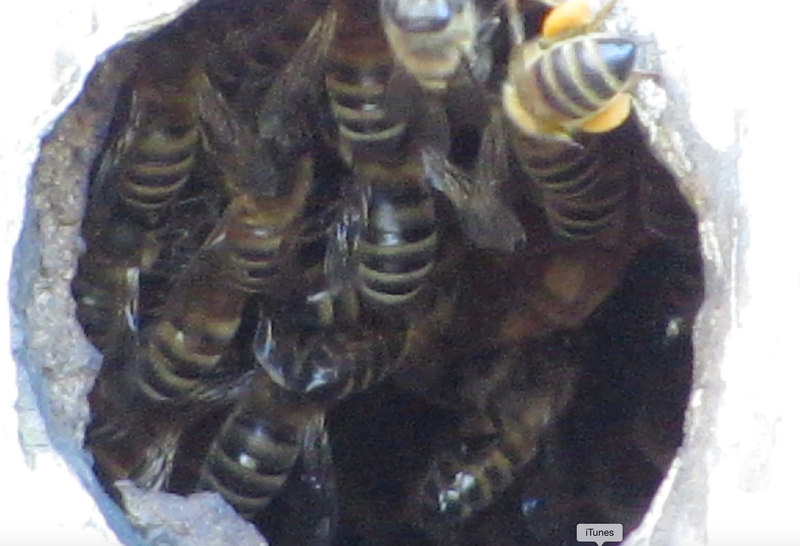 The video shows her rubbing her front legs and using them to scrape the pollen off the top of her body. I see Barbara out walking her dogs. She knows I’m obsessive about bees and mentions an ivy covered wall that was buzzing with bees. I head over. 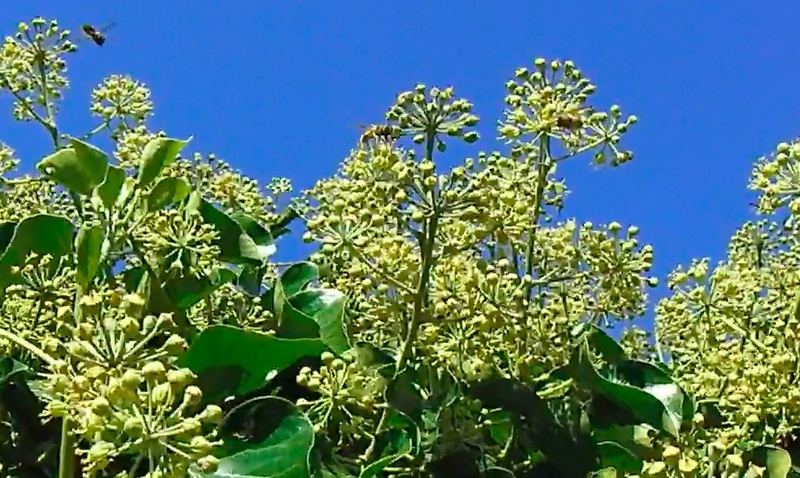 This ivy wall was buzzing with bees…I’m going to get lots of opportunities to shoot bee videos. I knew something was weird with this when her proboscis touched the top anther and rubbed it. 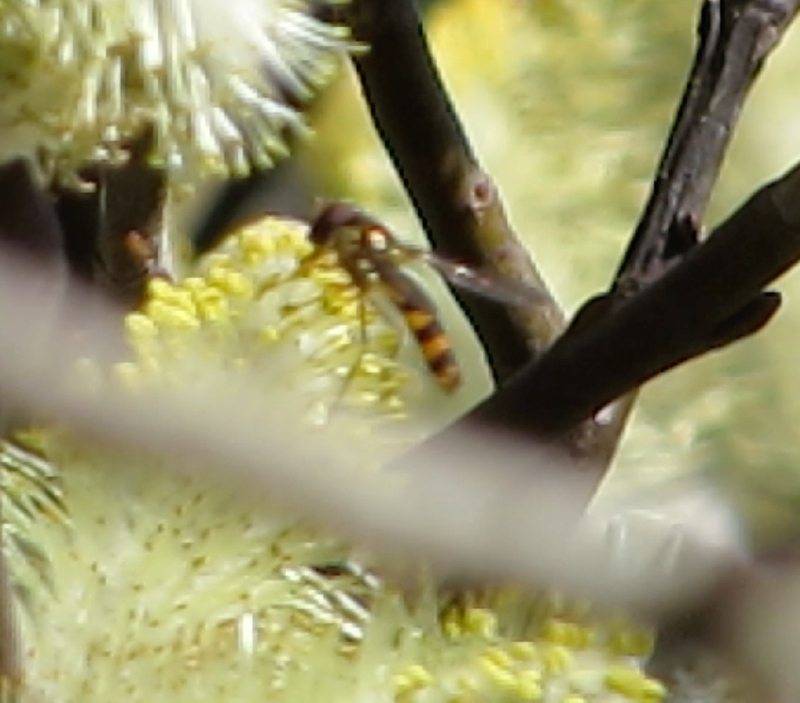 It’s another fly that resembles a bee. This looks like a white-trimmed black wasp, but it’s the wrong habitat for it. Can anyone ID it for sure? 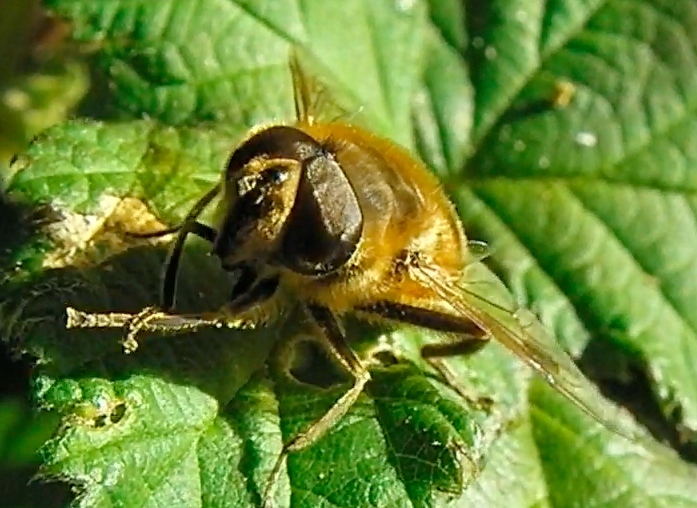 It’s another ‘buzzing insect’ working the ivy. Celeste A. S. Mazzacano, Ph. 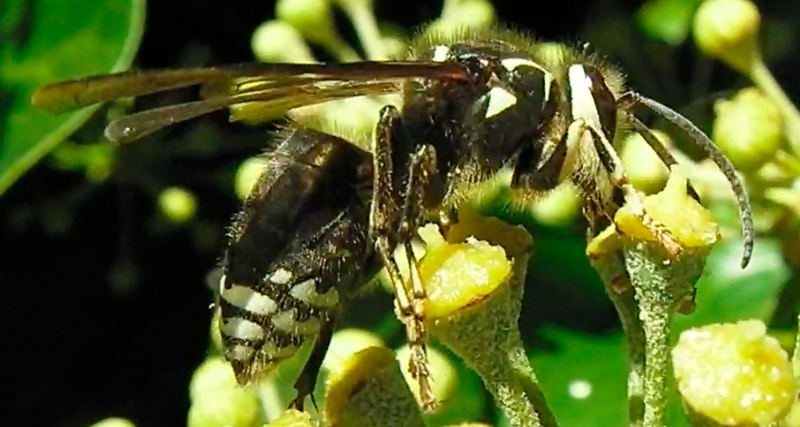 D.
Pat, I am pretty sure that what you have are some lovely shots of the White-faced Hornet (Vespula maculata, also known as Dolichovespula maculata, not sure which name is the most current). The markings are quite distinctive, especially around the eyes and thorax, and this is the only West Coast wasp species that is white and black–all the others are yellow and black. These dudes are apparently aggressive little stingers, and the adults are predatory on small invertebrates, so I don’t think they’d be more than incidental pollinators. 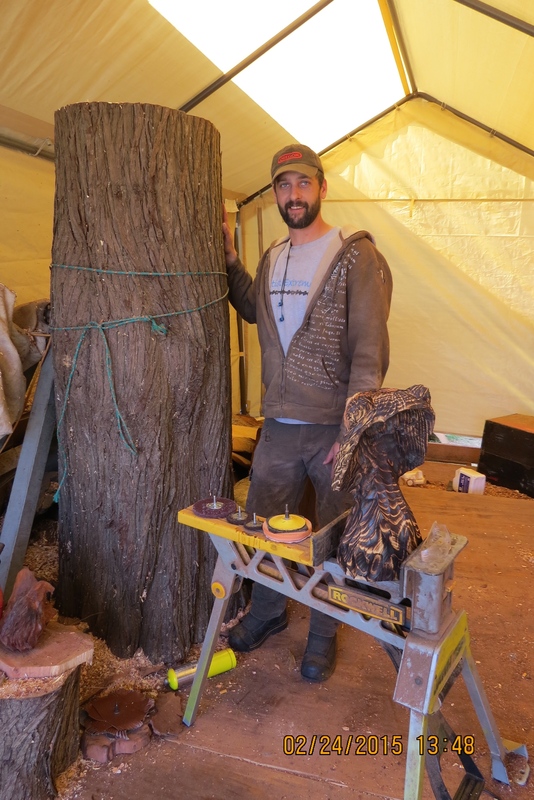 They make above-ground nests out of chewed wood pulp, but a colony only lasts for one year–they die off over the winter, except for females that mate at the end of summer and start new colonies the following spring. These are nice photos! Thanks, Celeste. 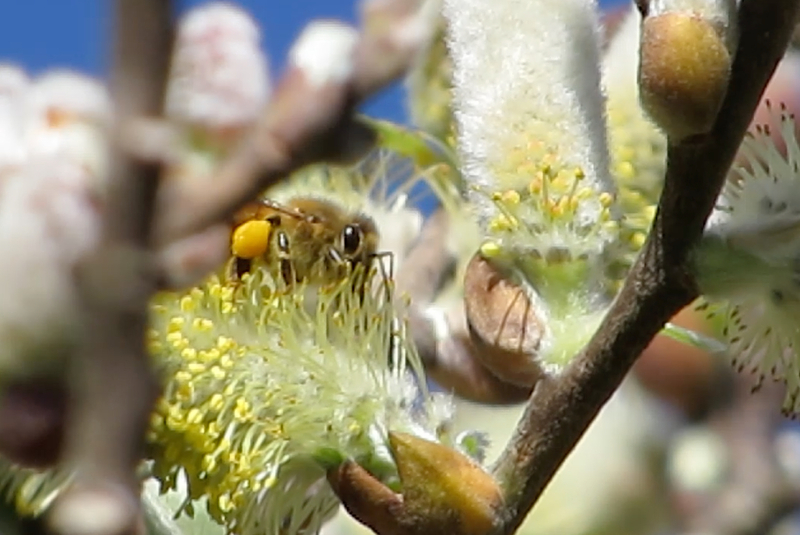 Finally I see an actual honeybee who is sipping nectar, but no pollen is evident. Another look, but no pollen is visible. 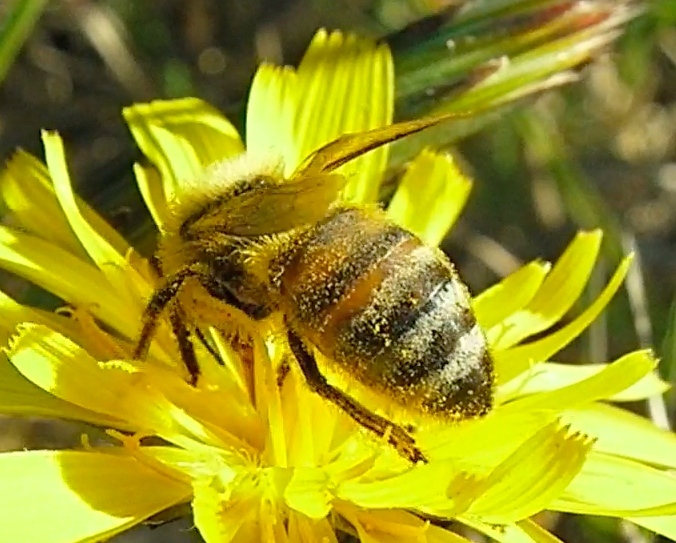 I spot a bee on a dandelion, pollen sprinkled on her abdomen. A close look revealed none in her pollen baskets. I can see I was mistaken about the pollen going into my hives. It can’t be ivy just yet…not sure what it is, but I’ll keep looking. 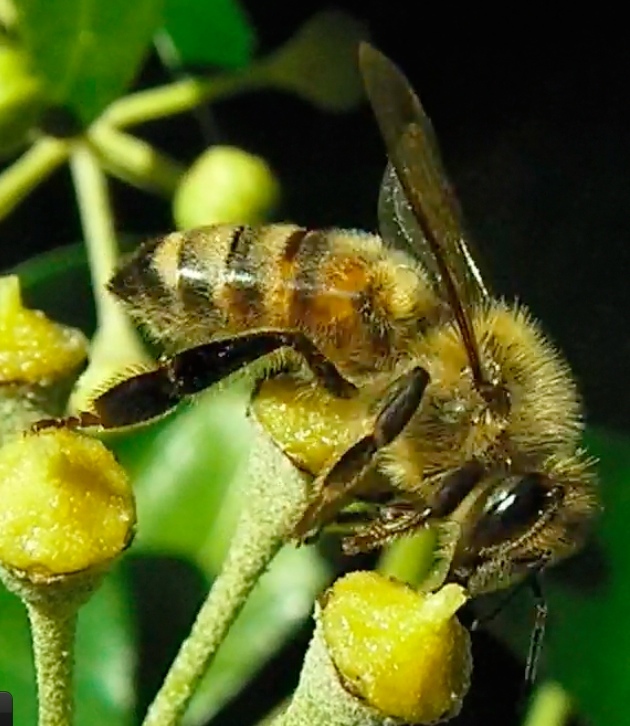 Patricia talks about the importance of ivy as a nectar source for insects late in the year.